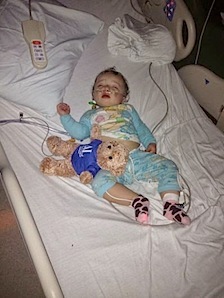 This is my daughter Ella, and she may be vaccine injured. On August 11. 2013 we sat in the PICU watching our baby girl struggle to breathe; it was exactly one week before her first birthday and this was her third admission to the PICU and her seventh trip to the ER for respiratory distress in her short one year of life. As we watched her sleep hooked up to all the monitors and machines, listening to the nurses and Doctors talking about having to intubate her we both had nothing left in us.... Something had to give here, she was going to die if this continued. It wasn't until a few week later when things calmed down that I was going through Ella's medical records and I was listing all of her hospitalizations next to all the dates of her vaccines. Ella was brought to the ER for breathing problems every single time within 3-7 days after the receipt of one of her routine vaccinations. No.... Nobody every told me any of that. I found it out all my own, the hard way. I was listening to the Doctors, I was listening to my friends, I was listening to the other moms in the mommies groups telling me I had a responsibility to the community: I needed to vaccinate my child for The Greater Good, I needed to do this to keep her safe and to protect all your children too. And I am angry. Angry as hell. Now, lets unpack this shall we. All out on the table. So now here I stand, in the middle of a Measles "Epidemic" looking at the possibility of being forced to inject my children with over 40 viruses by 1st grade because why? When did 100 cases of anything become an "Epidemic?" When did 100 cases of a disease that has a high fever and a rash mean I lose the right to make medical decisions for my family? When did 100 cases of a disease that hasn't killed a single person in the USA in over 10 years means I have to sacrifice my children's health for yours? The flu kills somewhere between 3,000 to 20,000 people per year... Where is the outrage for that? Car accidents kill over 40,000 people per year, better take cars away! In 2014 alone 3,540 families were compensated through the vaccine injury compensation program for death or serious bodily harm caused by vaccines (and those are just the ones the government conceded to and not anywhere near the total cases filed.) Where is the outrage? Where are all the people screaming for the vaccine manufacturers to be held responsible? Oh, Yah lets talk about that. In 1986 the Vaccine Injury Compensation Program was passed into law. Since its inception the program has awarded over 2 billion dollars to vaccine injury victims. Prior to 1986 the vaccine manufacturers could be held liable and sued for vaccine injuries; however, they were being sued so often and loosing so much money they went to the federal government and threatened to stop making vaccines if they weren't protected. The Vaccine Injury Compensation Program was born. Vaccine manufacturers are no longer liable from any harm that is caused by their products. How are people paid then for their injuries? That's the best part.... Every single vaccine given has a tax placed on it and put into a kitty, then when your child is killed or brain damaged and you go to court you are paid back from your own tax dollars. Let me see if I have this straight. It is very likely that mandatory vaccinations will become a law but there is NO recourse to hold the manufacturers responsible if it harms your child? Seems legit. I am going to say it again so it can sink in. You could be forced to give a drug to your child that could seriously harm them and if it does there is no way for you to hold them responsible. I may be forced to inject my child with something that has a side effect of DEATH. Yes, DEATH and will have no choice in the matter, you as well. Do you think vaccine reactions aren't real? Tell that to the mothers of perfectly healthy, walking and talking 2 year olds that took their child in for routine vaccinations and they collapsed and died 3 hours later. Tell that to the mothers of the 4 month old babies that put their children down for a nap after their routine vaccinations and they died in their sleep. Tell that to the mother of a child that could name all the colors and shapes, count to 50 and sing all the nursery rhymes and after their routine vaccinations they lost their ability to speak or feed themselves. Tell that to me, the mother of a child who has been on steroids since she was 6 months old, tell that to me when I look at my child and wonder if she will suffer from osteoporosis at the ripe old age of 5 due to the side effects of all the medications she needs to keep her lungs working. You think vaccine reactions are rare? That the small amount that have serious side effects are worth it for The Greater Good? Fine, give me your baby, lets add them to the list of vaccine injured children. If you are that concerned with all the immunocompromised children out there that you think its worth it, that my child's health doesn't matter, then give me yours, come on... lets trade. WE have sacrificed enough of our children to The Greater Good so you can feel safe. I am not Anti-Vaccine. I am not really Anti-Anything. I am Pro. I am Pro-Informed Consent. I am Pro-Being-Able-To-Make-Medical-Decisions-For-My-Own-Children. I am Pro-Being-A-Fierce-Advocate-For-My-Child. I am Pro-Not-Letting-The-Government-Dictate-My-Childs-Medical-Needs. Ella does not and will not qualify for a medical exemption. In the eyes of the medical and scientific community what happened to her was an unfortunate set of circumstances that has nothing to do with her vaccinations. In reality you pretty much have to have a seizure on the table 30 seconds after receiving a vaccine in order to get a medical exemption and even then its iffy. So now, here I stand, and I am now looking at the possibility of being forced to inject my child with something that may cause us to have to medically induce a coma and stick a tube down her throat so she can breathe. I may be forced to play the same game of Russian Roulette with my baby Maxine and just hope for the best, to just hope that her lungs don't fail also. How's your week going Pro-Vaxxers? This page contains a single entry by sal published on February 23, 2015 3:35 PM. Dozens of children feared dead after being injected with 'tainted’ measles vaccine in Syria was the previous entry in this blog. Epic Response to Jennifer Hibben-White’s Rant About Unvaccinated Children is the next entry in this blog.